A Rust: The Boy Soldier Review – Mega-Prologue! It took me a bit to figure out what exactly Rust: The Boy Soldier was. Obviously, it’s a prequel. But the synopsis indicates it’s a series of prologues compiled to make one…mega-prologue? Eventually I had to find a video where the author flat out explains it. (Keep in mind it had been awhile since I’d read the previous volumes of Rust.) Each of the three Rust books has a prologue scene. This book collects them all, plus an unreleased prologue from the upcoming final volume. Together they form one story that takes the reader right into the first story, Rust: Visitor in the Field. Hey, I’m an A.D.D. kid. Sometimes this stuff gets confusing. Either way, Rust is quality. 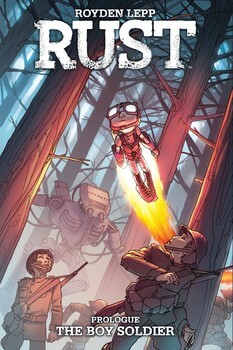 The Boy Soldier is set during a world war in which robots have been assembled to replace human soldiers. Our hero Jet Jones appears to be a boy wearing a rocket pack. But Jet is not what he seems. His origins have are beyond his wildest imagination, and he has responsibilities he doesn’t know if he can bear. The events of this book will set the entire Rust series into motion. 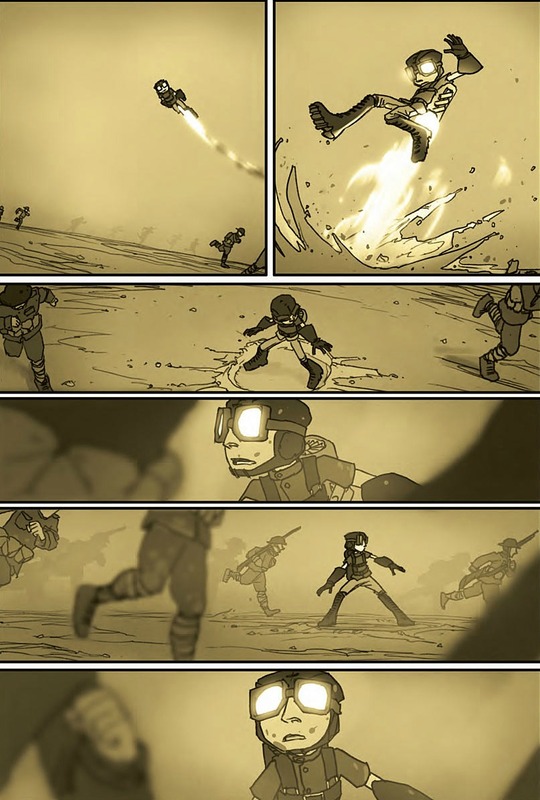 Even if the majority of The Boy Soldier isn’t new content, it’s worth looking at for a new perspective on Jet Jones. In Visitor in the Field, his origins are intentionally shrouded in mystery. In this book, many of the answers we wanted back then are on full display. We see Jet in the war, we see him talking to his creator, and we see him make the choice that result in him ending up on the Taylor farm. When you put all these stories together, it’s like a curtain has finally been lifted, and we can see a crucial part of who Jet Jones really is. 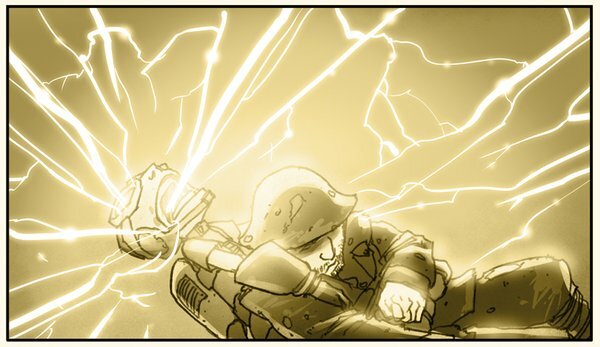 What’s interesting about The Boy Soldier is that it relies very little on dialogue. It will go several pages without a single word balloon or caption box. This choice emphasizes Lepp’s knack for things like cinematography, body language, and acting. For instance, there’s a scene where Jet, with full knowledge of who and what he is, is trying to pry something off of his person. There’s a lot going on within the span of just a few pages. In Jet we can read disgust, rage, desperation, and then finally pain and almost resignation. All this without a single line of dialogue. It’s a powerful scene, and Lepp’s best performance in the book. The book also includes a brief interview with Lepp, in which he briefly talks about his use of sepia tone throughout the series. Lepp says the sepia tone gives the series a feeling of “old times,” synonymous with old photos, etc. Lepp also says the colors can be associated with rusty metal, summer heat, heat from the jet pack, etc. Frankly, I think it does much more for the latter than the former. I always assumed Rust took place in a highly polluted atmosphere, what with the production of robots and all. Either way, the sepia tone contributes to to the feel of the series in a way that can’t be underestimated. Rust is a bigger and better achievement than people give it credit for. It’s about things like war, loss, and self-discovery. But it’s also a quirky, original story for all ages. Consider just how bereft mainstream American culture (not to mention American comics) is of fresh, new ideas nowadays. Now look at Rust and tell me what’s not to love. One might find some small faults, I suppose. But in the grand scheme of things, projects like Rust are what’s good about American comics in the 21st Century. This entry was posted in Comic Books/Graphic Novels and tagged Archaia, comic book reviews, Jet Jones, Rob Siebert, Royden Lepp, Rust, Rust: The Boy Soldier, Rust: Visitor in the Field, sepia tone, trade paperback reviews on 03/23/2016 by primaryignition.